Hailing a cab in this city is hard enough. But come New Year's, it's the sort of madcap free-for-all that can ruin the start of what is sure to be a fantastic year. So you'll want to know about Taxi Magic, a new iPhone app that lets you book, track and pay for cabs with just a few taps on your iPhone. You probably know about RideCharge.com—the site that lets you book a taxi online and pay for it on your mobile—but Taxi Magic takes things to the next (portable) level by connecting you directly to the taxi company's routing system (sort of like eavesdropping on the dispatcher). 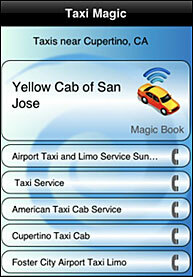 Just open up the app on your iPhone, click the "Magic Book" option at the top, view the list of your cab options, confirm your pick-up spot and contact information, then hit "book taxi." After you book your cab, you'll get instant updates with the taxi number, driver's name and, most importantly, how far your dispatched cab is from you. Just in case you have time to squeeze in another cocktail or two.